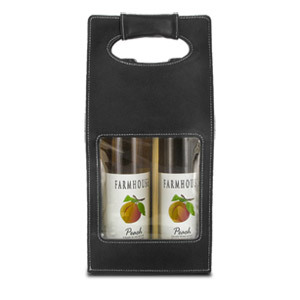 This Picnic Time Venezia Two-Bottle Wine Carrier features a sleek and stylish design made of premium leatherette with accent stitching that adds a dash of sophistication. The interior is velveteen with a folding divider and removable base which allows the tote to lay flat when not in use. The large clear window on the front creates an attractive display for the wine labels inside, adding more visual interest and elegance. Perfect as a tote to carry two bottles of wine to your next dinner party, or present as a gift, the Venezia makes any celebration extra special.